Director Liz Garbus has assembled a glittering constellation of movie stars to narrate the kaleidoscopic life of cinema’s ultimate bombshell. 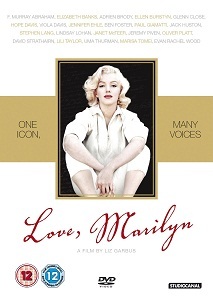 Her striking documentary draws on a recently unearthed trove of Marilyn’s own journal entries, letters and poems and intersperses spoken word with footage of her life, her loves and her end. Performing against an evocative backdrop of Monroe’s erratic handwriting, the narrators disclose a self-critical, emotionally articulate, three dimensional woman. The portrait, though hitting familiar notes, is refreshing and allows the actress to tell her own truth. This choice grants to Monroe a dignity that is often lacking in more dramatic coverage of her ‘iconic’ life. Especially bittersweet is her contemplation of suicide by bridge jump. She would need “an ugly bridge” to leap from but is “particularly fond of all bridges”. Conversely, it was the splash of Hollywood faces across the screen which lost this feature its fifth star. While the male narrators are uniformly strong, the many incarnations of Marilyn prove a distraction. Only Marisa Tomei hits the appropriate note – her carefully contained sadness moves – but in truth we need not have seen anyone but Monroe. God knows she could carry a film. The original theatrical trailer and an interview with director Liz Garbus. Notably refusing to trade on or take obvious advantage of Dwayne Johnson’s significant and seemingly unavoidable physicality, Snitch instead gives us a true story of a desperate father agreeing to go undercover and set up a drug deal in order to snag bigger fish. If he can succeed, his son, who foolishly got himself caught up in a drug-dealing sting, will be let out of prison as opposed to having to see through a ten-year stretch. Johnson’s character isn’t able to fight his way out of tight corners and must instead patiently and tensely try to work his way up the food chain to snag the head honcho that Susan Sarandon’s ruthless and inflexible US Attorney requires he snag in order to clinch the deal for his son’s freedom. Johnson convincingly portrays his desperate concern for his son and buries his hulking mass within a character who simply runs a construction company and happens to have access to big rigs for drug transportation. Sarandon, Jon Bernthal (as a conflicted ex-con working for and with Johnson) and Barry Pepper (as Johnson’s primary contact within the DEA) all give really good value as well-rounded believable characters and if the film lacks high octane moments or a barn-storming crescendo, it certainly delivers on tension and audience engagement. A lesser-known entry in Johnson’s copious CV, but well worth checking out. An almost feature-length making-of doc covers casting, using real locations and the real background story. A writer/director’s commentary (with the editor chipping in too) manages to not duplicate from the making-of too much and gives a very sincere analysis of the filmmakers’ considerable aspirations, with lots of drilling down into creative choices and the quest for verisimilitude. A handful of redundant and rightly-excised deleted scenes round out a solid set of extras.